WASHINGTON — President Donald Trump on Thursday gave his administration a "10" for its response to Puerto Rico's hurricane devastation, despite the widespread lack of electricity and drinkable water across the storm-ravaged island. Asked by reporters how he would grade the federal government's efforts after Hurricane Maria thrashed the island, Trump declared "I give ourselves a 10" and acknowledged it was a difficult situation for first responders. Joined by Puerto Rico's governor, Ricardo Rosselló, at the White House, Trump asked him if the federal government did "a great job" after the storm. 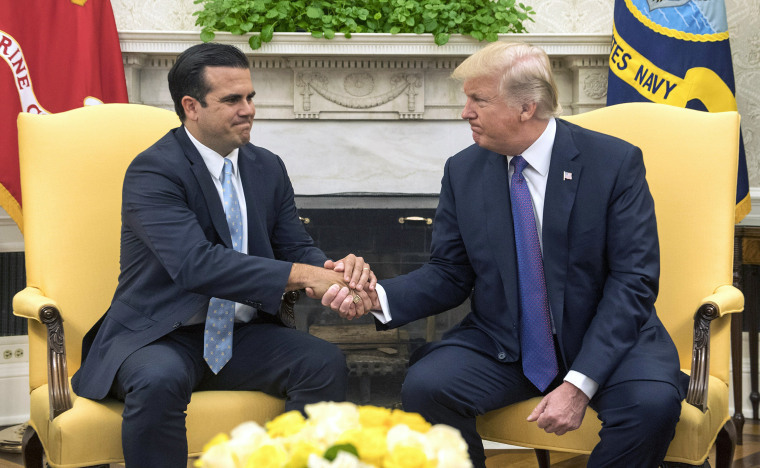 Rosselló responded: "You responded immediately, sir" but he also repeatedly mentioned that "there's a lot left to do." "We have provided so much, so fast," Trump said, praising his Federal Emergency Management Agency Director Brock Long, first responders and military officials on the ground. The administration has been harshly criticized, however, for its slow response to the storm in the days immediately after the devastation. Now, weeks later, Trump said the U.S. had an "obligation" to continue its commitment to helping Puerto Rico come back, but the president added that the time would eventually come when the federal government would have to pull out. At some point, Trump said, "FEMA has to leave" and "the people have to take over," but he declined to offer a time frame. The president said he thinks Rosselló and Puerto Rico understand FEMA and other federal agencies "cannot be there forever." "Locally, I understand," Trump said, empathizing with the hundreds of thousands who lost their homes to the storm. "Locally, a person loses his or her or their house and then they can't go to work ... it's not the people's fault. They lost their house, they were devastated." But his administration, Trump emphasized, has "done a really great job." On another front, a group of Democratic U.S. senators led by Sens. Elizabeth Warren and Ed Markey of Massachusetts, sent a letter to Elaine Duke, the acting secretary at Department of Homeland Security, raising concerns that the official death toll of 48 as of Thursday is inaccurate. The letter dated Thursday urged Duke's agency find out the true number. "The need for an accurate death toll is especially important because President Trump seems to be using the number of fatalities to determine the quality of the disaster response," the senators said in their letter dated Thursday. That letter follows another sent last week by Reps. Nydia Velazquez, D-N.Y. and Bennie Thompson of Mississippi who is the ranking Democrat on the House Homeland Security Committee. Their letter also asked DHS to take action to get an accurate count of deaths. Some reports have put the count at hundreds more that the official toll.